Charlotte Ridley, BHSII, has bitten the bullet and built a superb top quality Indoor Riding Arena - not only does it have a top of the range Pasada Euro Track surface but includes a fabulous range of show jumps and fillers. The arena itself is 58 metres by 22 metres, with a viewing gallery to seat approximately 185 people. Park End Equestrian welcomes riders, from all areas of the United Kingdom and internationally, of every level of experience and of all ages, the arena is available for private hire to individuals or groups. 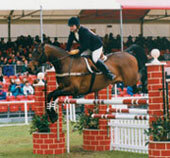 Charlotte is a registered BHSII instructor and recognised Horse Trials specialist who has ridden at the highest International Horse Trials level. 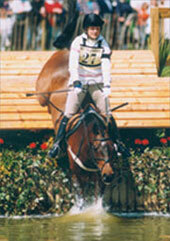 She has been both long and short listed for World, European and Olympic selection. To discover more about this exciting new venture, to book a lesson, clinic or to hire the school for your event or activity (within reason) please Contact Park End Equestrian now. From left to right: Emma Sherwood she is Charlotte’s secretary/nanny who is your main point of contact when booking or making enquires for Park End Equestrian. Rachel Clark mounted on Charlotte's Sophie the Super Cob! Rachel originally from York and with a Business Management degree she moved North where she decided to return to her first love of horses. 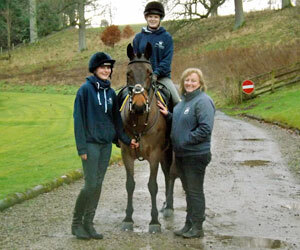 Rachel completed her HND Equine Management at Kirkley Hall, Northumberland College in 2011 and that summer joined the team at Park End as head groom. Rachel has gone on to achieve her BHS stages 1 & 2, also stage 3 in Horse Care & Knowledge and is working towards her Stage 3 Riding. 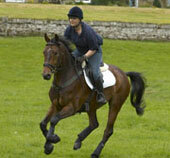 Charlotte Ridley who, along with her husband Nick, is the owner of Park End Equestrian Centre. Charlotte is a fully qualified Instructor and Horse Trials Specialist, her time is spent teaching, eventing and bringing on fabulous young horses for the Burghley Young Event Horse competitions. A fantastic team who all work together in making Park End Equestrian Training Centre a great success. A Newbie Goes to Camp with CDRC: What An Adventure! A fabulous review from a CDRC member with their camp experience. From March to September John and Charlotte will available on the same day so that you have the opportunity to have a flat and jump lesson in the same day. 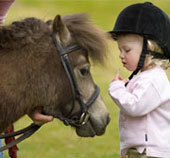 From November to March John will be available for Dressage training days in the Indoor Arena. Charlotte teaches most days of the week & some evenings. To avoid disappointment please book in advance. Training Camps £190pp from February - September, private bookings also taken as well as our own.